According to the Food & Agriculture Organization, food waste, “the discard of edible foods at the retail and consumer levels” makes up one third of all food produced. According to Drawdown, reducing food waste is the third most effective solution to combating climate change. The financial impact of food waste is considerable, as is the ecological impact. Therefore we should do all we can to reduce the amount of food we waste. When it comes to food at Williams College, we try to decrease waste and increase composting of unused or uneaten food. 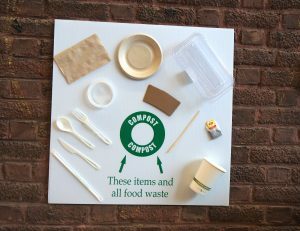 At each dining hall clearing station or dish return area, there is signage on the walls with updated examples of every non-food item that is compostable in that dining hall. In most locations, the food waste barrel has a 10″ hole with a magnetic rim around the edge to attempt to catch any utensils that accidentally get dropped in. What is compostable and non-compostable? Please see our comprehensive composting guide for more information. PJ’s Trash & Appliance Removal collects and empties this food waste daily into totes (essentially trash cans on wheels), where it is layered with sawdust until it is taken up to T.A.M. Organics in Bennington. 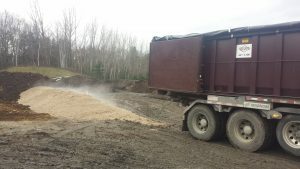 It is incorporated into large windrows with other compostable material where it breaks down and turns into compost that can be added as an enrichment to soil. Compostable plates, utensils, cups, and other items are increasing in popularity as an alternative to disposable items that will end up in a landfill. Williams Dining has moved in that direction as well for disposable to-go coffee cups and other coffee items (sleeves, lids, straws). However, the campus has some infrastructure impediments before we close the loop on this. Currently, as mentioned above, the only locations with compost bins are dining halls, Eco Cafe, Goodrich Coffee Bar, and the libraries. 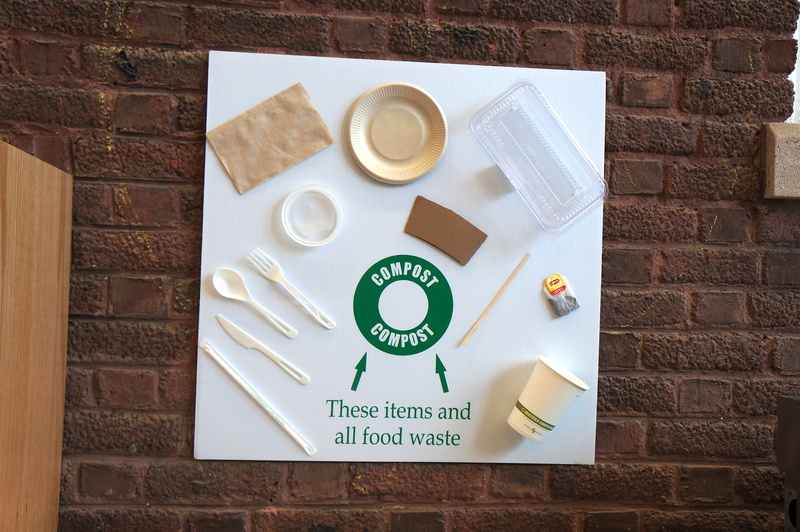 When one takes a to-go compostable coffee cup out of the dining hall in the morning and heads to class, there are few bins elsewhere on campus where those compostable items can be properly disposed. We have piloted a couple dorm-composting programs to try to begin addressing this issue. Other reusable initiatives to try offer other alternatives are Dining’s Reusable Container Program (for reusable clamshells for to-go food and reusable bags for Grab ‘n Go) and reusable to-go travel mugs. The Zilkha Center has been working with the Willamstown COOL (CO2 Lowering) Committee to align Williamstown’s food waste diversion efforts with the College’s. We have been reaching out to businesses, schools, and other institutions to see if they will join the town’s efforts. Visit the Table-to-Soil page for more info and to see which businesses participate.